WAM and ADS-B capabilities are provided by Comsoft Solutions’ ultra-compact remote sensors and interrogators linked to a Quadrant Central Processor, providing superior capability to secondary surveillance radar (SSR), with a higher update rate and greater accuracy. The overall system scope includes the implementation of three dual-redundant Quadrant Central Processors and Quadrant sensors at 104 locations, and is complemented by the Enhanced Supervision Management System (ESMS) for SNMP monitoring of the system. In a further step, coverage of the remaining part of Finland is envisaged by deploying additional Quadrant Central Processors, Sensors and Transmitters. “We are honoured to be working with the new ANSP of Finland on their first project. They have put their trust in Comsoft Solutions’ advanced Quadrant surveillance sensors and we are ready to provide the ideal solution to support their needs,” added Gerald Enzinger, Comsoft Solutions Managing Director. Nordic Finland, in Northern Europe, has a population of just 5.5 million, yet tourism brings in more than double that number in visitors per year. ANS Finland provides en-route services and local aerodrome/approach control services for airports, previously provided by Finavia Corporation, which includes area control services, airspace management, aeronautical search and rescue services (ASAR) and air traffic flow management (ATFM). The current Helsinki airport expansion plans to increase its current 16 million capacity airport to accommodate 20 million passengers by 2020, as tourism continues to increase. 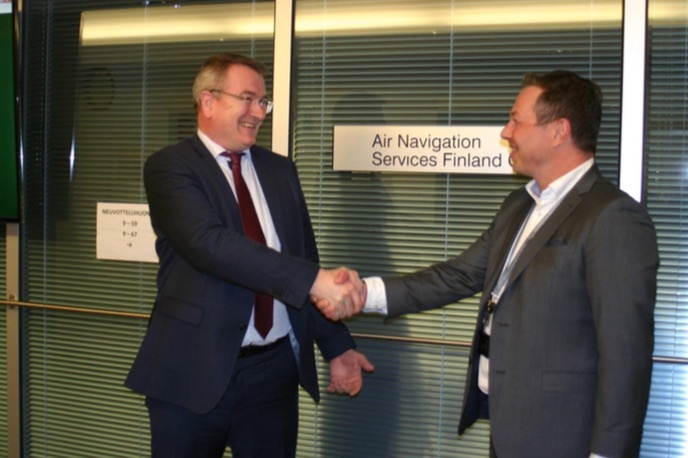 With a WAM network from Comsoft Solutions, ANS Finland is further prepared for the increasing demands of their service, providing heightened surveillance capabilities while improving flight safety and service quality. Image: Comsoft Solutions Managing Director, Gerald Enzinger and ANS Finland CEO, Raine Luojus after signing the first ANS Finland contract.